In these contentious times, we too often see how words can divide. 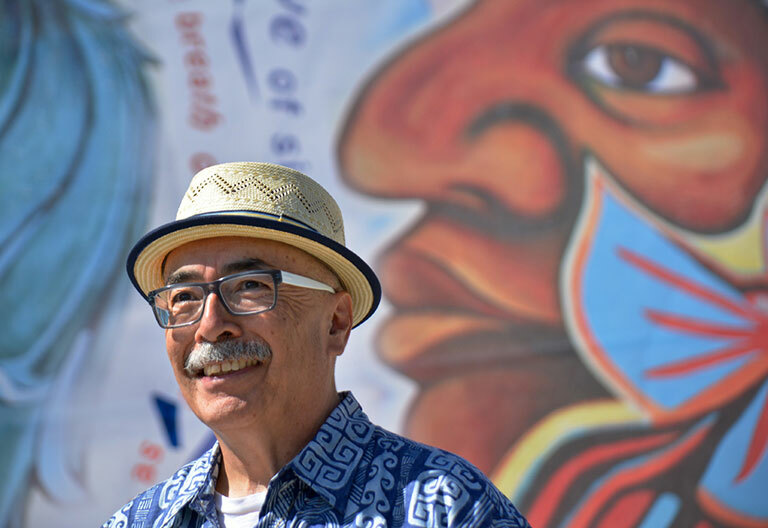 Poet Juan Felipe Herrera still believes words have the potential to heal and to bring people together. Herrera will appear at 7:30 p.m. Sept. 30 in Bloomington’s Buskirk-Chumley Theatre as part of Indiana University’s celebration of National Hispanic Heritage Month. The event “¡Poesía Now! The Power of Poetry in Our Lives,” is free and open to the public. Not only will Herrera share passages of his own work, but he hopes to inspire others to harness the power of language in their lives and communities. A question-and-answer session will follow the reading. Free, general admission tickets are required but will be available on a first-come, first-served basis 11 a.m. to 6 p.m. today and Friday and just prior to the event at the Buskirk-Chumley Theatre box office. This month Herrera began his second term as the Poet Laureate of the United States, the first Latino to hold this prestigious post bestowed by the Library of Congress. “Mr. Herrera’s work gives voice to a uniquely American perspective that for too long has been left out of our national story,” said Alberto Varon, an assistant professor in the IU Bloomington Department of English. “His poetry and other writing evokes experiences at once idiosyncratic and universal, unrecognizable yet somehow familiar. Through wordplay both playful and powerful that speaks across language and geographic space, his work helps us understand beauty in difference — not just that difference exists, but how it energizes creative expression,” Varon said. Born in California as the son of migrant farm workers, Herrera received an undergraduate degree at UCLA before earning a master’s in social anthropology at Stanford University and MFA at the University of Iowa Writer’s Workshop. In his poems, some of the words dance across the page in careful arrangement. Other works are nearly unpunctuated bursts of language and emotion, laid out in straightforward paragraphs. Yet with all their power on the printed page, his words are described as being the most alive when he performs them at readings. In addition to his appearance at the Buskirk-Chumley, Herrera’s whirlwind visit to IU will include a poetry workshop for selected high school and IU students. The workshop will draw upon “La Casa de Colores,” an interactive project from his first term as U.S. Poet Laureate. Herrera imagines the American cultural landscape as “The House of Colors,” and has solicited poems from across the country as a way of representing the diverse viewpoints and that make up the American experience. Herrera also will attend a private luncheon where he will meet with IU’s Latino students and students in the creative writing program and Department of English. Herrera’s visit is sponsored by the College Arts and Humanities Institute; Chiricú Journal: Latina/o Literatures, Arts and Cultures (IU Press); the Latino Studies Program; The College of Arts and Sciences Ostrom Grants Progam; the Center for Research on Race and Ethnicity in Society; the Center for Latin American and Caribbean Studies; the Creative Writing Program; La Casa Latino Cultural Center; the Susan D. Gubar Chair in Literature; the Office of the Vice President for Diversity, Equity and Multicultural Affairs; and the departments of English, Spanish and Portuguese, and American Studies, all at Indiana University.